Malaysian Odds, or Malay odds, are one way to correspond the relationship between your stake and your potential profit on a given bet. These odds depend on local customs and are similar to a local language in a way. If you show up in one country speaking a different language, people may not understand you. The same is true with bookmakers. If you are trying to bet using American Odds in a Malaysian book, they may not understand what you are trying to do. Luckily, using the internet, there are various calculators that can help determine the necessary conversions to and from different forms of odds. Malaysian sports betting is centered around soccer. Estimates run as high as 90% of all wagers placed in the country are bets on soccer matches. Although there are laws in place to try and curb this gambling, the underground gambling economy has truly flourished. Betting exchanges are very popular as well in countries such as Malaysia, allowing punters to back teams against each other and the house takes it’s cut from the winner. Here are a few examples that will help illustrate the conversion from American odds into Malaysian odds and back again. Malaysian Odds are expressed in decimals, either positive or negative. If the odds are “0” then it is an exact 50/50 bet and will pay out 1/1. This bet might come into play with a total or two closely matched clubs. Let’s take a look at some examples. The first one deals with an soccer match pitting Brazil and Germany. Brazil is a favorite and picked to win. The Malay Odds are 0.4. This shows that you will win $80 for every $200 wagered on Brazil. Using an online odds calculator, we come up with American Odds of -250. Example 2 is from the same game, but an in-game bet with the score Brazil 2-0. Brazil is favored to win at a -400 clip using American Odds. Winning: Stake x 1/Malay Odds $200 x (1/.25)= $800. Notice that the decimal always is positive for any winning bet calculations. Example 3 is a simple one where you are betting on the total in the Brazil vs Germany soccer match and you want to take the over 2.5 goals. This bet has Malay Odds of 0. As was stated earlier, this bet will pay out 1/1. So for every $100 bet, $100 would be paid out for the over. Malay Odds are pretty simple to figure out once you get the hang of it. 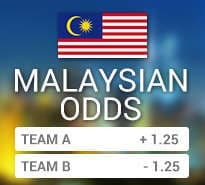 There are lots of online tools that can be used to convert to and from American, Euro, Hong Kong, and Malay Odds, so if you use a book that lists the odds in Malay Odds format, you can easily go back and forth. Hopefully this article helped explain the thought process behind the odds format and was helpful in figuring out how much you can win for each unit risked.